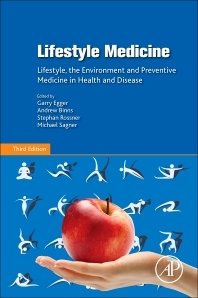 Lifestyle Medicine: Lifestyle, the Environment and Preventive Medicine in Health and Disease, Third Edition, is an adjunct approach to health practice that seeks to deal with the more complex modern determinants of chronic diseases—primarily lifestyle and the environments driving such lifestyles—in contrast to the microbial ‘causes’ of infectious disease. Our lifestyle choices have a profound effect on our health. As we live longer, one thing is clear: many of us will spend time living with injury and chronic illness due to our own choices. Changes in health patterns typically follow shifts in living conditions. Disease patterns have changed worldwide, from infectious to chronic diseases such as obesity, diabetes, and heart disease. This change has been so emphatic—nearly 70% of all presentations to a doctor in modern western societies are now chronic disease related—that medical services are being forced to change to accommodate this. New chapters in this third edition explain the link between energy intake and expenditure; consider how modern technology are determinants of chronic disease; show how environmental influences, such as endocrine disruptors, influence our health; and summarize recent research on early childhood experiences and chronic disease. Introduction: What is Lifestyle Medicine? Who is Best Qualified to Practice Lifestyle Interventions? Why Use Motivational Interviewing Techniques? How Much Fluid is Required? How Much Energy in Fluid is Recommended? Hunger and Appetite: Are They the Same? What is (Good) Mental Health? Is Positive Psychology the Way for Everybody? Why is Addressing Smoking and Drinking so Challenging? What Can the Clinician Do? Why Skin in Lifestyle Medicine? Professor Garry Egger AM MPH PhD is the Director of the Centre for Health Promotion and Research in Sydney and Adjunct Professor in Lifestyle Medicine at Southern Cross University in Northern NSW, Australia. He has worked in clinical and public health since 1972 and has been a consultant to the World Health Organization, industry, and several government organisations, as well as being involved in medical and allied health education. He is the author of thirty books, over two hundred peer reviewed scientific articles, over a thousand popular press articles and has made numerous media appearances. Dr Andrew Binns AM BSc MBBS DRCOG DA FACRRM is a general practitioner in Lismore in rural NSW, Australia. He has a special interest in lifestyle medicine and its relevance to primary care. He is Adjunct Professor with the Division of Health and Applied Sciences, Lismore Campus, Southern Cross University. He is also medical editor of GP Speak, a bi-monthly magazine for the Northern Rivers General Practice Network. Professor Stephan Rossner MD PhD was Professor of Health Behavior Research at the Karolinska Institute in Stockholm and Director of the Obesity Unit at the Karolinska University Hospital. He has worked with international obesity-related matters for more than twenty years and served as the Secretary, Vice-President, and President of the International Association for the Study of Obesity (IASO). He has published more than 500 scientific articles on nutrition and lifestyle-related matters, written more than twenty books for the lay press, appeared repeatedly in media, and promoted health as a stand-up comedian in ‘science theatre’. Michael Sagner, MD is a medical doctor specializing in sports medicine and preventive medicine. He is also a certified fitness trainer and certified sports nutritionist. He is founding head of several international projects focused on clinical chronic disease and risk factor treatment and prevention. Michael Sagner is actively involved in scientific research in the field of preventive medicine and has developed the ‘cell to community’ approach, which aims at connecting basic research, clinical medicine and public health to address chronic diseases. His research interests are the underlying mechanisms and causes of chronic diseases and interdisciplinary approaches in clinical treatment. His research considers the complex interactions within the human body in light of a patient's lifestyle, genomics and environment. This is a comprehensive text covering lifestyle - and not restricted to what many people understand by 'lifestyle'. By covering the determinants of lifestyle related diseases we can begin to apply solutions to man-made problems.